The user interface of Windows 7 can be translated and converted to another language, with the use of a language pack, commonly known as MUI (Multilingual User Interface) or LIP (Language Interface Pack). With language pack, text in wizards, dialog boxes, menus, and other components in the Windows 7 UI can be converted into another display language from the default display language installed. 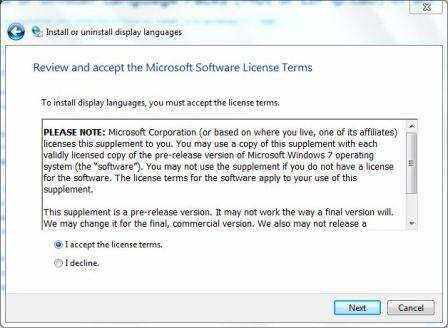 Additional language packs for supported editions of Windows 7 (i.e. Windows 7 Ultimate and Windows 7 Enterprise) can be downloaded via Windows Update, from MSDN and TechNet Subscriber Downloads section, or by downloading the leaked lp.cab cabinet files or LIP’s ISO images that float in Internet. If you manage to download additional language pack cabinet files, use the following how-to guide to install the new display language. Note: If you downloaded a DVD or CD ISO image, extract the lp.cab file from the image first. 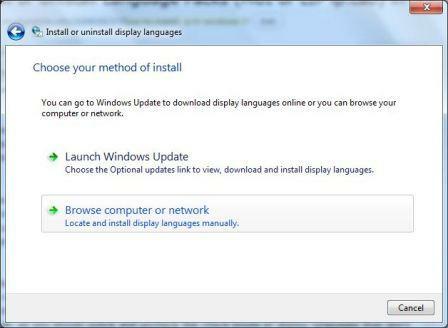 This guide assumes that you’re not using Windows Update to download and install the language pack, which will be done automatically. In Category view, click on Clock, Language, and Region link. 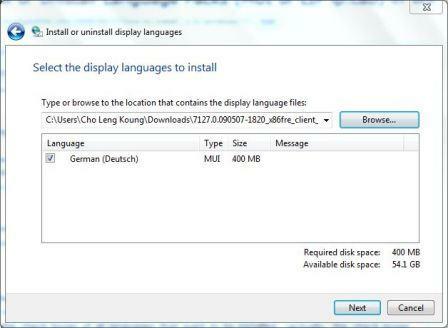 Click on Install or uninstall display languages under “Region and Language” section or Install/uninstall languages under “Display Language” section”. 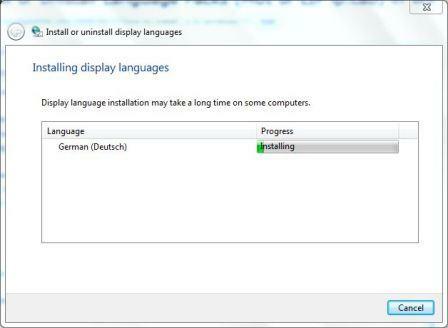 In the “Install or uninstall display languages” wizard, click on Install display languages. Click Browse computer or network to locate and install language packs manually. Type or browse to the folder that contains the language pack files. The language file must be in .CAB extension, typical named as “lp.cab”. Once selected and if at least one valid language pack (either MUI or LIP) is found, the wizard will list all languages available to install, together with native name, type (MUI or LIP) and size. 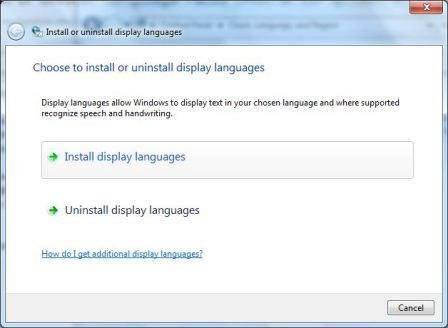 Tick the check boxes of all languages that want to be installed. Actually, the check boxes are checked by default, so you should untick and uncheck the check boxes of display languages that don’t want to be installed. Check the radio button for I accept the license terms, then click on Next button. Wait for the installation to finish, which may take a while. 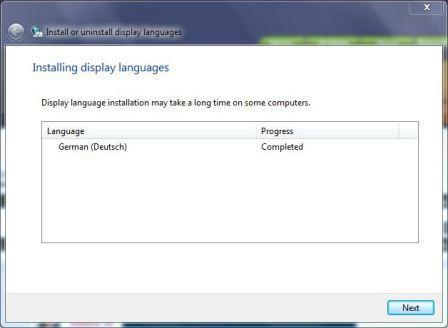 Once all selected language files is installed successfully, a confirmation screen will be shown. 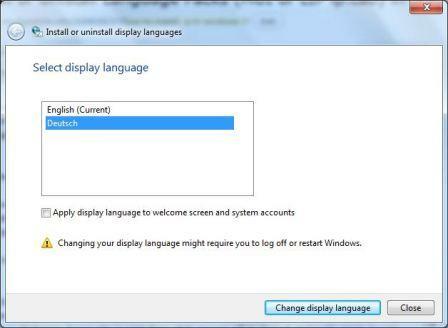 If you wish to change to new display language, select the desired display language from the list of languages available. Then, click on Change display language button. Optional is whether to also apply the new display language to welcome screen and system accounts. Else, click on Close button to exit.